The Bold and the Beautiful (B&B) spoilers for the next two weeks tease that some emotional episodes are coming up. The week of January 1-5 will bring some tough blows. Liam (Scott Clifton) will have to deal with the fact that Steffy (Jacqueline MacInnes Wood) not only cheated on him, but did it with his own father. He’ll lash out at Steffy for sleeping with Bill (Don Diamont) and ruining everything. Meanwhile, Wyatt (Darin Brooks) will pick up on Bill’s strange behavior. It looks like he’ll mention something about Steffy’s pregnancy, but Bill’s reaction will prove puzzling. Wyatt will wonder what Bill has heard and why he’s acting like this. He’ll definitely think his dad’s attitude is peculiar. Bill will manage to cover up the truth, so Wyatt will head on his way. Later, Liam (Scott Clifton) will show up for a wild outburst. He’ll hurl objects around the room as he shouts about Bill’s despicable actions. 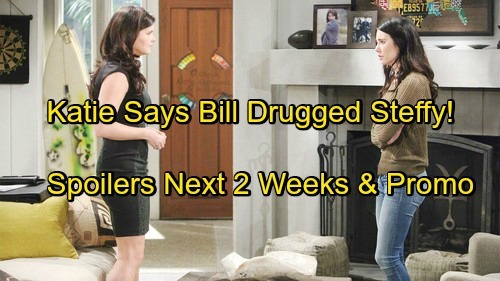 The Bold and the Beautiful spoilers say Liam will eventually lunge at Bill. They’ll end up trying to get each other in a headlock on the floor. After Liam exits, Bill will be left alone with his thoughts. He’ll have to accept that one night changed everything. Liam will completely loathe Bill after Steffy’s revelation. Katie (Heather Tom) will stop by to see Steffy, but she’ll be in for a shock. 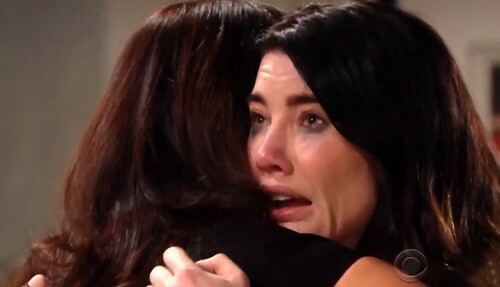 B&B fans can expect Steffy to be out of her mind with panic and remorse. Katie will notice the paternity test results on the table. She’ll glance at them and figure out what’s up. When Steffy admits to sleeping with Bill, Katie will wonder if it was all a scheme. She’ll suggest that Steffy can tell her if Bill drugged her drink. However, Steffy will contend that she knew what she was doing. She’ll feel horrible, but Katie will pull her in for a hug. Elsewhere, Maya (Karla Mosley) will shut down Carter’s (Lawrence Saint-Victor) interest in her. She’ll make it clear that she’s a happily married woman, but how long can she really leave this option off the table? Carter will certainly hope that Maya changes her mind. The week of January 8-12 will deliver a bombshell. Wyatt will be taken aback when Liam updates on his relationship woes. After Liam reveals Bill and Steffy’s hookup, Wyatt won’t even know what to say. He’ll be sorry Liam has to go through this. Finally, Hope (Annika Noelle) will return to Los Angeles. Ridge (Thorsten Kaye) will make all the arrangements so Brooke (Katherine Kelly Lang) can have a nice surprise. Brooke’s joy will get a boost when Hope announces that she’s staying permanently. She’ll be happy to have her daughter in town again. Are you looking forward to these hot storylines on The Bold and the Beautiful? We’ll keep you posted as other B&B news comes in. Stick with the CBS soap and don’t forget to check CDL often for the latest Bold and the Beautiful spoilers, updates and news.